Hello gorgeous! Yes, you! It's me, Shay, with a bright and happy card to share with you today. 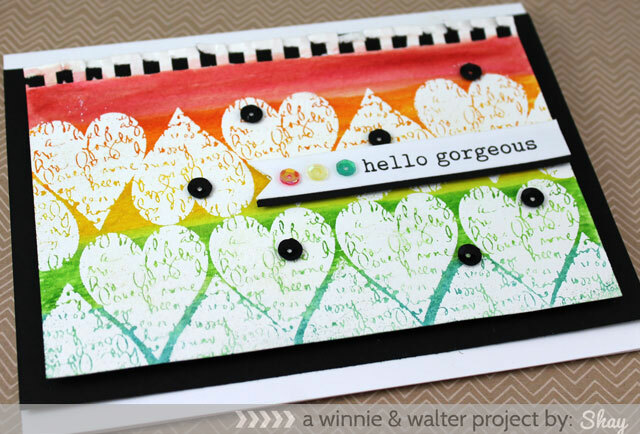 I love using embossing powder and Distress Inks with my stamps. A whole lot of creative play can be done by using those key ingredients, don't you think? I pulled out the script heart from You've Got Love Mail and inked it up with Versamark and got to stamping on a piece of watercolor paper. I heat embossed the hearts in stages with white embossing powder. After I finished the heart pattern I pulled out Distress Ink in fired brick, spice marmalade, mustard seed, mowed lawn and broken china. I smeared some of the ink onto an acrylic block and used a water brush to pick up the ink and add horizontal stripes of the color in a rainbow pattern. With a damp rag I wiped off the embossed section to remove the ink. On a banner I die cut using a Papertrey Ink die, I stamped "hello" from The Big, the Bold, and the Happy and "gorgeous" from The Big, the Bold and You in onyx black Versafine ink. I adhered that onto a piece of black cardstock and to the heart panel with foam dimensional adhesive. Then I adhered the hearts panel with foam dimensional adhesive to a strip of black cardstock attached to a white card base. I finished up the card with some sequins, of course (I may need to enter a sequins support group soon!). Hope you've enjoyed today's card and your Wednesday is as fabulous as you are! Super cool card Shay! Looks like you had lots of fun in its creation. 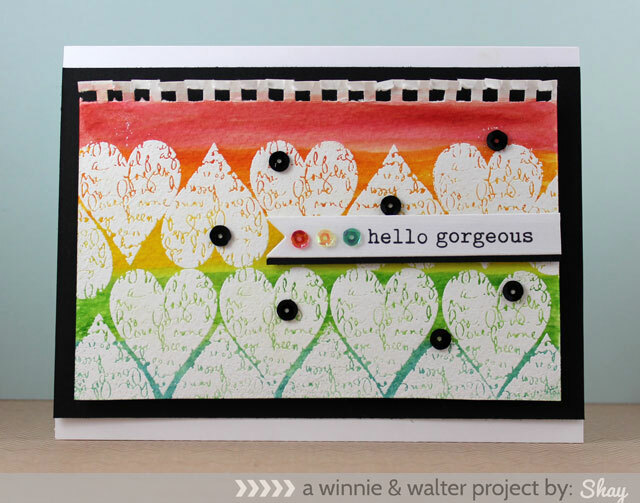 What a beautiful card I love the colors and the embossing!